Freddy the cow pictured after adoption by New Jersey sanctuary. A runaway cow who garnered national headlines Thursday after escaping a Halal slaughterhouse in New York City will be spared death thanks to an animal sanctuary in New Jersey. The rumbling cow surprised motorists and pedestrians in Queens who took photos and short clips of the animal on their cell phones Thursday afternoon. 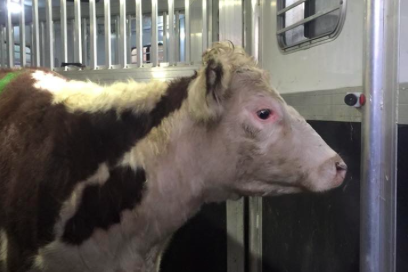 After 30 minutes on the loose, the cow was captured by police in a parking garage and returned to its owners at the Jamaica-Archer Live Poultry and Meat Market, according to ABC News. After hearing of the cow's bold dash on Facebook, Mike Stura, owner of the Wantage, New Jerse -based Skyland Animal Sanctuary and Rescue in Wantage, jumped in his car and drove up to Queens to rescue the animal. A worker at the market initially told Stura that the cow was claimed by another family planning a large event and was scheduled to be killed Friday, but Stura told the manager that he wanted to give the animal a good life. Stura has since named the cow Freddie in honor of Queen's Freddie Mercury and plans to introduce him to 18 other cows at the sanctuary in the next two weeks. A statement from Colleen O'Brien, spokeswoman for PETA, commended the cow for its bravery. According to a tweet from the New York City Police Department, Freddy was decent enough not to cause any damages or injuries.